A brief history in Christmas Letters! Yes, we're one of those families that sends Christmas letters, partly out of a genuine desire to let friends and family know what's been going on, but also as a belated apology for not staying in better touch the rest of the year! As time creeps past us all, you’ve helped to make us good, helped to make us happy. Never fear the mountains, and never fail to feel small when you see the ocean. The news this year is mostly good, although some dear friends have left us, and we cannot imagine the sorrow and loss that’s being caused by fires in the area as we write this. When we reflect, and look ahead, we always recall that nobody succeeds alone. We have all of you to thank for our good memories and good times. Thanks for being our family and friends. May our love and friendships continue to grow in 2018 and beyond! We hope this Holiday Season finds you happy and well. We have been out of touch during the holiday season for much too long. The holidays, which used to take forever to arrive, now slip by without a moment’s notice. Then we realize that one more year has passed at warp speed. We do think of you often and do enjoy hearing from each of you. Even though another year has already passed, we want to thank all of you who were able to join us to celebrate our 50th wedding anniversary in June of 2014. It was a wonderful celebration held on the Channel Cat, our favorite catamaran. Our six grandchildren are all growing up. That is both scary and wonderful. We now have two teenagers in the group. Suzanne, with 5, has reached the point of never having enough food in the house. Since 4 of hers are boys, she probably never will. Of course, Kayla being the only girl, will probably never have enough shoes! Karen’s son Kai, in Seattle, has weathered some major health issues, but has come through with flying colors. We are all so thankful for his amazing recovery and for all of your prayers and positive thoughts. It has been another very busy year with our many activities and friends here in Santa Barbara. With 18 years here, we still love it. We do not miss the snow but would like a bit more rain. Any amount would help, but ending the drought would really be great (just not all at one time!). I still find it amazing that we can get fresh fruits and vegetables at outside markets every week of the year. We were in Cleveland Ohio for the Shaklee convention this year. Our Suzanne joined us along with friend and Shaklee associate Kelly Patti. We were sorry that Karen was not able to join us. The weather was perfect and the conference was one of the best ever. It was great to see so many young people attending and interested in learning. We had hoped the Cleveland trip would have us able to get together with some of our remaining family, but we are sorry that didn’t happen. We followed the convention with a wonderful visit with good friends (and Bob’s Ohio University classmate) the McClearys in Maryland, with a day at that other ocean. Of course crab eating was involved. Bob continues to pretend (not well) that he’s retired. Consulting work has continued, but fortunately without a heavy travel schedule. We wish all of you a very happy and healthy 2016. If in your travels, you find yourselves in or near Santa Barbara, give us a call. We would love to have you visit. We’ve been a bit more naughty than nice, skipping the cards and newsletter for a couple of years. Losing several family members during that time added some extra duties and priorities, but these events make us realize the importance of those remaining. The California move continues to be the “right” decision, with fun and opportunity. Today’s networks, computers and smartphones do help us to stay connected with long-time friends and family, while missing some of the weather we found harder to take. Bob and his sister Ruth in New York City use the technology, as does Ellen with Cleveland cousins and friends. Our social group, The Graduates of Santa Barbara Newcomers, continues to be a joy! Yes, it takes some time to organize 100 or so events per year for the group of about 300 people, but we have help from a close-knit and hard-working board and our wonderful membership. We both also stay active locally -- Ellen with the Transition House Auxiliary, a family support non-profit, and Bob on the board of the Science and Engineering Council. Ellen leads our involvement in the Shaklee business, which has always held an important place in our attempts to stay healthy and active. The annual sales conference is always fun: Nashville in 2013 and Long Beach this coming August. The company’s leadership keeps quality and interest high. California weather helps, too -- we have tomatoes ripening on our hydroponic “tower garden” at this moment! Bob is a consulting engineer with a group in Washington, DC that contracts with the Federal Aviation Administration. Thanks to the network, he doesn’t travel frequently, but there are some loooong phone calls and online conferences! He and a consulting colleague from SB did a business aircraft convention in Las Vegas, and Bob returned for a short time to aircraft inflight high-voltage charging work for a firm in Los Angeles. Our personal travels included our annual trips to San Diego (plus technical conference for Bob) and Monterey (the Jazz Bash by the Bay, with friends from SB) plus Portland, for time with friends dating back to those navigation-conference days. Then a delightful Columbia River sternwheeler cruise, including our first experiences with marine locks and an exciting jet-boat ride through the Hell’s Canyon rapids on the Snake River. Side trips to the Mt. St. Helens volcano and other places, many related to the Lewis and Clark expedition were entertaining and informative. We’ve visited with daughters Karen and Suzanne and the six grandkids in Seattle and Toledo. Karen’s son Kai plus Suzanne and Andy’s crew Brandon, Luke, Kayla and the twins Sam and Max are growing up much too fast! The daughters surprised Ellen (and Bob) with a visit to California for Ellen’s birthday this year. It turned out to be a wonderful day in Santa Monica with the girls and special friends. Then a long-distance train trip to Seattle for Thanksgiving, again with family. The train ride is becoming a tradition, a chance to get away from the routine, meet new people, and have some quiet time followed by a visit and feast with Karen and Kai. The scenery through the Cascades is magnificent. We’ll be celebrating our 50th (!) anniversary in 2014, and preparations are already underway for hosting family and friends in June. With The Graduates social and educational activities for experience, we should be good at organizing such an event, but it is turning complicated already! Wishing everyone happiness and health in the new year; May 2014 be merry and bright! We hope your year has been filled with positive experiences. Santa Barbara continues to agree with us; we thought life would slow down as we got older, but perhaps we’re just not capable of any less activity! The large distances do mean less time with children and our six grandchildren, but any time we can spend with the next generations is golden. We did slow down a bit for about 10 days in October and took our first trip to Hawai’i, spending 3 days in Kona on the big island with a delightful friend. We had the added benefit of being there for the World Iron Man Triathlon. We were exhausted by the end of the day, just knowing what these athletes went through. We then spent a week on Kaua’i with friends from the east coast. There’s much contrast between the two islands – Kaua’i being more rural and even more laid back than the big island. It would have been much too hot for work, but lounging, reading, exploring, and just being with good friends was a special treat. We might even be able to get used to this! There was some sadness in the year, as we come to expect in this time of our lives. Aunt Irene, Ellen’s Godmother, passed away, leaving another empty space in our world. The Shaklee convention in Anaheim, CA was wonderful, especially since we didn’t have to fly and we were able to experience the achievements of younger daughter Suzanne, mother of 5 and triathlon athlete, building a successful Shaklee business, following her sister Karen in this endeavor. Having both girls join us in this business fills us with pride as well as gratitude for a company that guarantees its products are backed by research. During this same trip we were able to spend time with friends in Irvine, CA and attend the Pageant of the Masters. If ever you get a chance to view this festival event, you will be absolutely amazed. Also, Bob always enjoys spending time with former students and colleagues, in this case one who has achieved much success in the aviation world. Bob’s own air navigation consulting continues … more or less half-time and still enjoyed. We hope that life will go on without stress or sadness. We know that is a challenge at this time in our lives, but we are truly grateful for the good fortune and good friends that we have and the chance to live in sunshine most of our days. May your days be as blessed. Please have a wonderful Holiday Season and a very positive and happy 2011! We hope all is well with you and your families. We miss getting to spend time with many of you, but you are in our hearts and prayers. We are beginning our 12th year here in Santa Barbara and hope never to take the beauty of the ocean or the area for granted. Since last we wrote, we have doubled the number of grandchildren. Karen and Duncan have Kai, a wonderful and energetic six year old. Suzanne and Andy have Brandon (7), Luke (4), Kayla, our only girl (21 months) and Max and Sam, identical twins (7 months). We figure it will be a while before they get to visit California again, unless they buy an airplane. We continue to work with The Graduates (of Santa Barbara Newcomers), which has been our favorite socializing group. We really enjoy this exciting group of friends. We also enjoy being part of The Stardusters ballroom dance club, which helps our “happy feet”. We have had a few challenges, with wild fires dancing across our hills, three times in the last 16 months. The Gap fire came within a half mile of our home and became cause for concern with all the smoke and ash making breathing difficult. The most recent Tea fire was much more destructive, with over 200 homes lost. We are thankful the fires missed the homes of our friends, but our hearts go out to so many others who were not so lucky. The International Loran Convention was held in London this year. The convention was excellent, and London had snow in October for the first time since 1934. (They need not have done that for our benefit.) We were delighted to see friends who we seldom get to see, even though many of them live in the US. Of course, Bob who doesn’t understand this “retirement” thing, works and consults on a regular basis with many of these friends and colleagues. 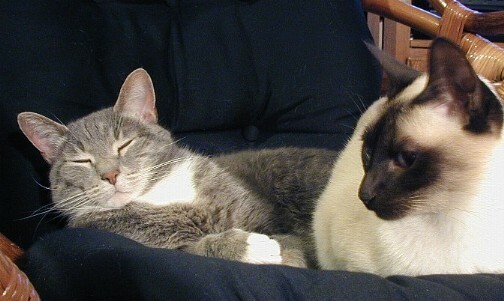 Our two kitties, Niki and Yuko keep our life interesting. Yuko, our two year old, is now our “golden” kitty, after a compound fracture. She has healed beautifully and Niki takes her job as “watch kitty” very seriously. Our girls, their husbands and all the grandchildren will celebrate Christmas together in Ohio this year. However, we will not travel this Holiday Season, so our hearts will be with them and we will eagerly wait for pictures and stories. We hope for everyone a wonderful, healthy and successful 2009. Love and Blessings to All. 2006 has been a roller-coaster year. We have come to appreciate more and more the value of friends and family. We had some wonderful times and some very sad times. The passing of Ellen’s mom allowed her to be free of pain and at peace, without more worry or suffering. However, it created a large void in our lives and she is missed very much. We take this time to celebrate each of our parents. We are blessed to have such wonderful memories! In April we drove to Las Vegas to spend time with favorite friends from the east. In our case, this is not a gamble, but a joy to spend time with very special people. In May, we adopted a new kitty, to give Niki a playmate, or torturer! How much trouble can a 1 1/3# kitty be? Don’t ask! Yuko has stolen our hearts and sleep and anything else she can find, including Niki’s sanity. The announcement by Suzanne that they are expecting their third child in April, 2007, brought joy again to all of us. She has truly taken on the job of “full time mom”. Sometimes we think this is just so she can continue to play with all the toys too! Brandon is now 5 and Luke is 2, so she will definitely have her hands full. Thank goodness Andy doesn’t mind doing most of the grocery shopping. Karen and Duncan and Kai, now 4, are still enjoying Seattle, even with its cold, rainy and short winter days. When it is not raining, Seattle is very beautiful. All three of them seem not to mind the cold. Karen’s job with Starbucks keeps her very busy and Duncan is working more and more with “Green” planning, construction and environmental issues. In his “spare” time he does all the repairs and remodeling on their 70-year-old home. This year Shaklee celebrated 50 years. Karen, Duncan and Kai and Suzanne and Bob and Ellen all attended the convention in San Francisco. There were almost 10,000 people in attendance and it was quite an event. Shaklee introduced two new, wonderful product lines that show Shaklee’s dedication to protecting the environment and helping people to live healthier lives. We would be glad to share more information with you. We continue to work with and for the International Loran Association. This year the 35th ILA convention was in Groton, CT. We traveled a couple days early and spent time with ILA President, Langhorne Bond and his wonderful family. The weather was wonderful and we just caught the last of the fall colors. Bob is still “retired” and working as much as ever on “ground and space based navigation”. Some things really don’t change! However, we do take an occasional day off to visit our favorite wineries, galleries, visit with friends or just to watch the ocean. We are ever grateful for the very special memories of those we have lost and the support of wonderful friends. We hope 2007 is a very good and successful year for all of you and that we can spend more time with each of you. As we take the ornaments from the Christmas tree, adjusting to the silence, we hear the echoes of delightful children’s voices from only a couple weeks ago. We were so blessed to have all the grandchildren, Brandon (4), Luke (1) and Kai (3 1/3) together, along with their terrific parents! The Christmas-week weather was perfect for playing on the beach and running about. Even the weather was sad (three days of rain) that two of the cousins went back to Ohio for New Year’s. However, the rain didn’t stop the rest of us from getting out, and for Karen and Duncan to run on the beach in the rain on their anniversary, while grandma and granddad had the pleasure of taking care of Kai, or maybe he was taking care of us! 2005 was a challenging year. We lost cousin/stepsister Nancy to cancer. We lost our big gray kitty, Gwindal, to the passage of time. Sister Bonnie and Ellen had to prepare, with Bob’s help on electrical and more difficult things, and sell Mom’s house and store her many years of memories as best we could. Through all of that process, Bonnie and Ellen learned that they could work together, even with the additional challenge of distance (for Ellen) and kennel business (for Bonnie). Learning to communicate with each other effectively has been an added blessing. 2005 also had some fun times. We attended the Shaklee Convention in Chicago with 3000 other Shaklee distributors. This was Roger Barnett’s first full year as owner and CEO of Shaklee Corporation, and it was a great beginning. A third of the attendees in Chicago had been with the company for 25 plus years and another third were new people. Over all, it is a great balance and great to be a part of this wonderful company. In 2006 Shaklee will celebrate 50 years with a major celebration in San Francisco in August. The company is preparing for 10,000 attendees (with 6000 already signed up). San Francisco may never be the same! We also had a great time on a two-week cruise to Alaska with friends who completed the cruise by getting married on Catalina Island. Following that cruise, Bob and Ellen hosted the 34th annual Int’l Loran Association Convention at Fess Parker’s Resort here in Santa Barbara. Early November, we did a short “Jazzdagen” cruise from LA into Mexico and back, on Crystal Harmony’s last US cruise. Of course, Bob is still consulting and busier than expected in “semi retirement”. Very nice to choose one’s timing, however, and travel, and spend time with friends too! As we start off 2006, Mom is being moved to the next level of care at Sunrise Assisted Living in Willoughby, Ohio. She will, therefore, be moving from Aspen cottage into Cedar. We will let you know her address change. Holly, her beloved dog and companion, is moving with her. We are concerned with the much smaller space she will move into, but we understand the need for a caregiver being in the cottage 24/7. Mom loves visits from family and friends, so please help to make this move more palatable with your visits. Our best wishes to all of you for 2006. We hope you will be blessed with a great year. We hope that all of you had a wonderful and blessed holiday season. The end of 2004 was so exciting and busy that we decided to defer the holiday letter until after the new year. Supposedly things would settle down a bit by then. Wrong again! However, we still want to stay in touch and wish each of you a wonderful new year. We ended 2004 with the addition of a third grandson, Luke Robert Harshman. We had the privilege of spending some precious time with him and his big brother Brandon, and well as his wonderful parents, in Toledo. That event took us through Thanksgiving. Christmas found us in Seattle with grandson Kai Chalmers and his wonderful parents. We have no idea how we have managed to be blessed with the most brilliant grandchildren on the planet. New Year's found us on the American Queen sternwheeler on the Mississippi with good friends Berkeley and Mike. This was a "Jazz Cruise", and Ellen's comment was, "I thought I didn’t like jazz”. I was wrong. We had a fantastic week. The International Loran Association took us back to Japan in October 2004. The ILA conference was in Tokyo. We were able to take the shinkansen high-speed train back to Nagoya where we lived for three months before moving to Santa Barbara. We had a great time with friends there, even with a very short visit. Bob retired in April, but we haven’t noticed any slowdown. He keeps busy with consulting and all the things we’re "into" here in Santa Barbara. We are still very much involved with the workings of The Graduates (our social group after Newcomers) and Stardusters (our dance club). We try to visit the grandkids as much as possible and also my mom and sister in Ohio (when it’s not winter). We continue with our wonderful part time and growing Shaklee business. We are delighted to be part of a company that believes so strongly in saving our health and our planet, and are ever grateful for friends who believe the same. We hope each of you will work to make 2005 a great and rewarding year. If you find yourselves in our neck of the woods, do plan to visit. We’d love to show you our beautiful little corner of paradise. Merry Christmas and Happy New Year to family and friends! We are truly thankful for being able to live in Santa Barbara and enjoy the ocean and the mountains and the outdoors everyday! We ended 2002 with both our girls and their families here for the holidays. What a wonderful Christmas with one-year-old Brandon and three-month-old Kai. It is amazing how full a house can become with two tiny ones (and all their gear). Bob actually made a request for his birthday in January 2003. He wanted to go to San Diego to have a Champagne Brunch at our favorite motel on Mission Bay. We took the train and turned the celebration into a Spa weekend, for both of us. What a treat! 2003 went on to become very busy. There were trips to Ohio, Seattle and Colorado for us and, of course, Washington for Bob. Staying in sight of the grandkids every few months is a necessity. They just grow too fast! But what joys they are to listen to and watch. Ellen’s mom seems to be adjusting to her “apartment, assisted living” arrangement, and we know she enjoys being around people. Of course, her dog Holly is her constant and special companion. We just finished a wonderful Thanksgiving with Bob’s sister Ruth visiting California and us for the first time. We tried to give her a taste of Santa Barbara in the few days she had with us. The weather even cooperated (even though this might be considered the start of the rainy season) and stayed sunny and about 65 to 70. As we wish you all a very Merry Christmas and wonderful, healthy 2004, we are again packing our bags and getting ready to spend Christmas in Toledo with kids and grandkids at Suzanne, Andy and Brandon’s new home (they moved in November 6th). May 2004 be a great year for each of you. We wish you the best and hope our paths will cross at least in friendship and thoughts and maybe even sometimes in person! Come visit if you want to see what paradise is all about. You are always welcome! Bob and I wish family and friends a special holiday season and a blessed 2003. We are so fortunate to have such wonderful friends and we treasure and value those friendships. This past year has been a wild ride. We are joyful for the happy times and will remember the sad times and treasure the memories of both. December 13th of 2001, our first grandson, Brandon Andrew Harshman was born in Toledo, Ohio to our daughter Suzanne and son-in-law Andy. Words cannot describe the joy of that first grandchild. As we write this Christmas letter, Brandon is about to celebrate his first birthday and mom and dad will celebrate beginning to get a full night’s sleep. Christmas 2001 was celebrated in Toledo with Brandon at two weeks and proud mommy and daddy. Christmas dinner was with the Harshman family and was a very special time together. We are so blessed to be part of this extended family. Bob’s dad celebrated his 90th birthday in February and Suzanne, Andy and Brandon were able to make the trip for Pop to see his first great-grandson. Four-generation pictures were taken, of course. On a sadder note, Ellen’s mom developed Macular Degeneration and began losing her eyesight rather rapidly. Early spring she noted that remaining in her home without being able to see, was getting more and more difficult. Discussions followed and the search began for a suitable assisted living facility where Holly, mom’s wonderful Sheltie, would be allowed to live with her. We finally settled on the Marriott MapleRidge, which is bright and friendly and not far from where she lived for many years. Leaving her beloved home was difficult at best, but we are hopeful that with time she will become comfortable there. She walks more than ever and enjoys the programs and especially visits from friends and family. On September 9th, 2002, our second grandson, Kai David Chalmers joined his parents Karen and Duncan in Seattle, Washington. Now, the next best thing to your first grandchild, is your firstborn having her firstborn and your second grandchild! We now have two of the most adorable, “smile-iest” grandbabies in the world. We are very grateful and our hearts almost burst with pride! The end of September saw the end to our membership in the Santa Barbara Newcomers. It is hard for us to express our gratitude to this wonderful organization, for being there and allowing us to participate and have such a wonderful experience. The Newcomers organization will always have a special place in out hearts. Wanting that experience to continue and to keep touch with the many friends we have made, we with a group of graduated newcomers, started a group called The Graduates. With 113 new members since its beginning, we are delighted that many others also feel the desire to continue friendships and new experiences. Communication is by E-mail and the Web, which is a challenge for a group that came from a 15-18 page paper newsletter. Who says we can’t all learn new tricks? On October 8th, we lost Bob’s dad and suddenly became the older generation, at least on Bob’s side of the family. Although Pop was almost 91 and had a wonderful, full life, his parting has certainly left many empty spots, especially in the many hearts that he touched We know that he is glad to join mom and his brothers, sisters and many friends who went before him, but the world will not be quite the same for those he left behind. He never got to see his second great-grandchild in person, but thanks to the Internet, was able to see him on his neighbor’s computer through many wonderful pictures. Very shortly after Pop’s passing, our good friend and neighbor for many years in Athens, Ohio, Bill Biehl also passed away. The Biehls were our life support, and the best friends a young family could have, as we started our own family back in Athens many years ago. We know this is a hard time for Marge and our prayers are with her and her family. We are grateful for their friendship. We have had many trips for work (Bob continues to work full time) and family this year, but are finally able to spend a bit of time in Santa Barbara as the year draws to a close. Thanksgiving was especially wonderful and different. With no personal family around, we joined a wonderful group of friends, and had Thanksgiving dinner on the beach. The weather was perfect and the food was fantastic. It was a full Thanksgiving feast with turkeys and all the trimmings. As the year draws to a close, we are looking forward to an invasion of kids and grandkids for Christmas. The house will go from 2 to 8 people, with two being 1 year and under. We look forward to a very joyful Christmas, and we hope you do too! Our annual holiday letter finds us looking forward, with great anticipation, to the blessed event of our first grandchild, due December 24th or maybe December 18th . What greater joy can there be?! 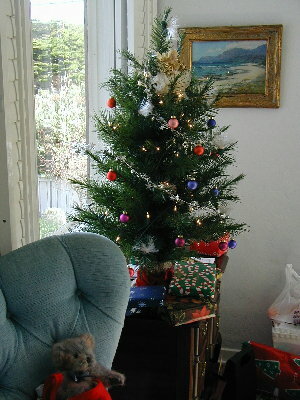 Christmas 2000 in Carmel was different, being away from home, but one of the most relaxing and enjoyable times we can remember. The bed-and-breakfast "family" welcomed us with quiet and comfortable charm; good food and a little sherry in the evenings. The days were long walks at the ocean, exploring the galleries and shops, a lunch at the fabled Pebble Beach golf course and a visit by Karen and Duncan for a Christmas dinner buffet. Visited with Karen and Duncan in San Francisco in April, and we four were on the Bay with officials of the National Boating Federation for Opening Day of the boating season up there. A glorious sunny and warm day on the water with good food and friends. Then back to the kids' home and a strenuous walk with their dogs Bailey and Jack. Karen and Duncan moved to Seattle in July so Karen could take a store-design leadership position with Starbucks, and Duncan has transferred within Turner Construction. They have more than doubled their living space and "the boys" have a wonderful yard in which to chase the squirrels. We do miss the shorter trip for visits between San Francisco and Santa Barbara, however. Bob continues to mix business and pleasure on trips East; he has a method for working in Washington and visiting his father in Charleston for a few days on some trips. Crosses paths with his sister Ruth on some trips also. Played hooky one day in the summer, to see "The Lion King" stage play in Los Angeles. A very imaginative and enjoyable adaptation of the Disney cartoon. Production at the newly renovated Pantages theater on Hollywood Blvd, where Oscars used to be awarded. Beautiful old-line theater, but with fully modern production equipment. Ellen returned from a Cleveland trip with a Siamese cat! She was a gift from a friend of Suzanne and Andy, and at first a reluctant resident in our house so fully occupied by Gwindal, our long-time tabby. The new arrival is about 1/3 his size. They are getting along well after initial grumbling, especially since she has taught Gwindal his place! Another trip to the East for Erin & Mark's beautiful wedding in September; she is the sister of Suzanne's husband Andy. Bob was shanghaied to play piano a while (which he loved) at the dinner. Ellen's mom has come through her many surgeries very well, although with some rough moments. Her spirits seem to be improving, especially since sister Bonnie bought a new place, with room for a larger kennel business, much closer to mom. We have greatly enjoyed visits this year by JoAnn Culbertson, Dave Diggle, Bill Roland, and Bruce & Jane Ergood, as well as our pride-and-joy, daughters and hubbies, of course. If you plan a trip out west, please plan a stop in beautiful Santa Barbara. Our guestroom is tiny, but the price is right and we love company. Many things have taken place in this year of 2001. We are grateful for our wonderful families and friends who help us realize the power of friendship in a troubled world. We pray for peace and comfort. May each of you be blessed with the pride of being an American and may we all feel the strength of unity. We wish each of you a very Happy New Year. P.S. Watch our web site - A GRAND-BABY IS COMING!!! Welcome to our annual Lilley year in review! Last Christmas was very special with both daughters' families Karen/Duncan and Suzanne/Andy in town for Christmas, Disneyland, Pacific kayaking and New Year's Eve a mile out on the Channel Cat (the largest catamaran of its kind) to watch the fireworks all along the coast. An amazing first anniversary for Karen and Duncan. Ellen began the year 2000 being elected President of the Santa Barbara Newcomers, our 700-strong group whose many events she now feels we must attend! What great fun we had with music, kayaking, and receptions….mainly meeting and making wonderful friends. We are even contributing to a book the group hopes to publish about Newcomers and their adventures. Ellen enjoyed this six-month adventure more than any other lifetime event! We commemorated the term with dinner at the Biltmore with special friends, ocean views, and all the trimmings. Memories are really made of this! Bob adapted music and collaborated on words for the overture to a Newcomers musical-revue production, and the audience and press liked it! He also developed a trio (flute and bass clarinet, plus his piano) as one of the performance-art pieces for this event. This was a chance to enjoy working with his music-a chance to relax in mind and body! Hope and Dave Diggle honored us with a visit in January and Jean and Dale Johnson did the same in September. Wonderful times with good friends near our ocean! We were invited to Lake Tahoe for Suzanne's 30th in March. No down hill for us, but two days of cross-country, with the "snow snakes" grabbing our feet many times, especially on the first day. It was nice to spend time with both daughters and sons-in-laws and some of their friends. Of course, we were the oldest people there, but they put up with that because we act so young…and we cook! We're looking forward to an Alaska cruise next year. That's Suzanne's planning again -- we must have trained her well, to appreciate fun and neat places! Bob's been back to Washington several times on business, and visits Charleston, WV with his father when he can. His mother died in May after a long and good life. All the children and grandchildren and their families visited with her over Mother's Day, and she said to us, "I can't be in charge any more; you will just have to take care of each other." We'll do that, and keep our wonderful memories. Another loss to our family late this year was the passing of Bob's Uncle Roy Lilley in Kansas City. A 101-plus year life for a true gentleman, full of optimism throughout. Everyone who had a chance to know Roy was truly blessed. We will all miss him terribly. Ellen has spent a great deal of time in Cleveland to be with her mother through quadruple bypass surgery in September and tumor surgery in November. Both surgeries were successful and mom is working hard on recovery. We are very thankful! With the surgeries over, maybe we can again work on mom's email skills. We were both able to take a side trip from hospital visits to spend a beautiful Thanksgiving Day in Toledo with Suzanne and Andy and families. Visits with the Harshmans bring back fond memories of Ellen's younger days with large family gatherings. Thanks to email, we've seen lots of pictures of Karen's store-construction projects for The Gap, and mid-size "grandpuppies" Bailey and Jack. Karen, Duncan, Bailey and Jack and Duncan's sister Sheila have all visited this year for some relaxing time at the beach and to see the "Big Bugs" display at the Botanic Gardens. Bailey and Jack are good company on such outings, but they tend to terrorize the cat at home! Gwindal evened the score (and came away with a little bit of Bailey's hindquarter) at one point. Ellen's still running the Operations Center for the International Loran Association, and Bob is Secretary and maintains their web page at www.loran.org. John Beukers is now ILA President; it's been fun working with good friends and colleagues over the years with this group. We once again assisted in running the ILA's annual convention, in Washington. Next year, Paris! After leaving Washington, Bob was able to have a few days with his father in Charleston and a short stop in Athens for talks and visit with former Avionics Center co-workers. His efforts helped to bring a major Federal Aviation Administration contract to Illgen Simulation Technologies, and he is busy finding people and starting up that work. We set up a web page for our Shaklee business; we're now officially Lilley Health Enterprises, at www.bemorehealthy.com (cool web name, huh?). Actually, the name is more interesting than the site, YET! Check us out and watch for our changes (suggestions welcome, too). Bob also started a page www.carbidecamps.net to feed his habit of remembering things past. The page seeks to involve former Union Carbide kids who attended company-run summer camps near Charleston, WV. It's been a good hobby, with lots of response from other campers from the 40s through the 80s. The ocean still plays a part (we really do live here). It is our "sanity" check! We enjoy kayaking when possible and even took a boat trip to Santa Cruz Island off the coast, amid sightings of flying fish, very large waves (ummmm), dolphins, some hiking and impressive views of ocean and mainland from the island cliffs. No whales sighted yet! 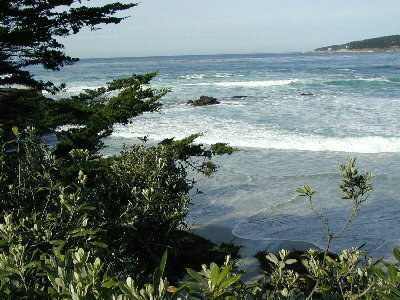 We're looking forward to a quiet December 25th this year in Carmel by the ocean…This will be a real change for us, being away from home for Christmas! Hope this finds all of you healthy and happy, and just where you want to be for the holidays. Well, some say it's the last year of the millenium. As usual, not everyone agrees, but in any case, 1999 has been another eventful one. We're just sure 2000 will follow, whatever it's called. Daughter Karen and Duncan Chalmers were married last New Year's day on a catamaran at Key West, Florida, with daughter Suzanne and husband Andy as attendants at this nearly-surprise event. (Ellen and I guessed late in the game that something was planned!) We had receptions for the happy couple in Santa Barbara and in Cleveland, so the distances were not so daunting for family and friends in the east and west. The Madrigal Singers helped us celebrate in Santa Barbara. This costumed group sings classical English songs and carols; in our living room with 35 guests for a sit-down reception dinner it was special indeed! We're finding that there are seasons here; there have been some cold winter mornings, and even a few below freezing (for an early-morning hour or two). Since coming to California, we've seen El Ninõ and La Ninã … Malibu mudslides … fires in the mountains … even an earthquake or two … but so far at a safe distance. We got both cars into the garage! This is a real event, involving much planning, ruthless clearing-out and very creative use of a storage unit. Hope it lasts! We both have "reconnected" with Bob's sister Ruth, the New York City branch of the family. There's been no problem, of course -- just the long distance and everyone being so busy. She will spend Christmas with the Lilley parents in Charleston this year, and Bob will visit for a few days before the big day. On Cleveland visits, we outfitted Ellen's mother with some e-mail hardware, and we've both worked to get her "connected." She's pretty comfortable receiving e-mail at this point, but there is another session needed on handling the sending end. Ellen's sister Bonnie is an e-mail user and can probably help, too. Her kennel business near Columbus keeps her really busy. Bob made a pilgrimage back to Ohio for a technical meeting at the University; another chance to see long-time friends and colleagues. We both managed a trip to Bob's 40th year (40th ?!) high-school reunion in South Charleston, West Virginia; stopped at Ohio University on the way, and Bob played a concert with the Community Band to tune up for the SCHS marching band event the following day. Marching through the home town on a hot day was worth every moment! Saw many old friends; great fun. On one of the trips back to California, Bob's airliner flew just north of Athens and our former place in The Plains, Ohio; got a bit misty remembering that we had good times there also. Under the heading of "things to do in and around Santa Barbara," we outline our busy lives -- We've been whale watching in Santa Barbara Channel (Bob glimpsed one, but we've not yet seen the full out-of-the-water performance); there's ocean kayaking with the Newcomers group and with the "kids," generally followed by a chicken luncheon on a friend's sailboat. We received a sailing lesson from him; beginners! With Karen and Duncan, went to the annual Garlic Festival (yes, garlic) at Gilroy, where tons of the stuff is grown. Yes, it's sauteed, fried, raw, ice cream, etc., etc. ; a real state-fair atmosphere. Name dropping: Santa Barbara is the home of a variety of celebrities. In nearby Las Olivas, talked with Fess Parker (remember Davy Crockett? ), owner of a well-known winery, and a hotel there where we had lunch. Bob went to the Concours D'elegance classic auto show with some friends, and had a chat with Jay Leno, showing off his Bugatti auto. Lord Edward Montagu, of Beaulieu, near where Bob's family lived in England, also attended, and entered a car from his large collection. (Bob went to his auto museum and traction engine rally while in England a long time ago.) We attended a program of Christmas readings, with Jeff Bridges doing "The Night Before Christmas." British singer Sarah Brightman's concert at the Santa Barbara Bowl was a delight. … not to forget the zoo, one of our favorite haunts. We've "adopted" the Meerkats, and are called "foster feeders," a way of supporting the zoo. One of our favorites, an otter, died this year of old age, but we have a new baby giraffe! Suzanne and Andy ran, biked and swam the Toledo Triathlon this year, both finishing in under three hours and within six minutes of each other (…we won't tell…). Ellen was there, but Bob was sorry to miss this, remembering how much fun it was to support them in their Chicago Marathon run two years ago. We marked our 35th wedding anniversary party at home; we were glad to have Karen and Suzanne, Duncan and Andy here. Also, after such a short time in Santa Barbara, we were moved that so many of our new friends came to help us welcome this milestone. Bob's uncle, Roy Lilley of Kansas City, celebrated his 100th birthday this year, and Bob was able to arrange a trip to attend the party. Roy was honored this year with the French Legion of Honor for his service as an Army pilot during the war. Ellen hosted as "proper" an English Tea as possible (given that we are colonists, after all) for a group of British friends now living in Santa Barbara. No Mad Hatter or White Rabbit, but a fine garden party with much food, tea and conversation lasting right through the afternoon. Very civilized, these English traditions. Bob collaborated on music, words and script for the overture to the "Grande Foire des arts," to be produced by the Newcomers in Santa Barbara in January. Rehearsals are underway through the holiday season. Those piano lessons "way back when" continue to come in handy! A nice and relatively inexpensive hobby. Ellen followed up her term as VP Activities for Santa Barbara Newcomers by being elected President. This is a 700-member group of very active and interesting people relatively new to town (sports, eating, performing arts… sometimes more than one activity in a day). It's a six-month position, and very intense. Bob is on the Newcomers Board, handling the club's computer support for mailing lists, etc. The opportunity to meet people and make new friends has been the real Newcomers draw for us. Bob wrote a couple of papers on his technical work, and we traveled to London in November for the Loran Association conference, held at Church House, right next to Westminster Abbey. Good friends, good food and good sightseeing. Then a technical session at the Beukers' cottage in the Cotswolds (John Beukers does navigational system monitoring there) and a driving tour of some small towns down the west coast into Devon and Cornwall. Some legendary Arthurian sites, seacoast towns and gorgeous pastoral scenery, and a fabulous evening and five-course dinner at Thornbury Castle, near Bristol. Ellen and Karen trained for the Avon 3-day breast cancer awareness walk, held in October. This was a 60+ mile walk from Santa Barbara to Malibu, down the coast near Los Angeles, with some 3,000 participants. Bob did a little training (couple of 10 to 15 mile walks with the Santa Barbara Group), but didn't even come close to the over-800 miles Ellen walked to get ready. Both E and K walked every inch and finished tired but in good shape. Many of you helped sponsor this effort. Thank you! We just returned from Thanksgiving with Karen and Duncan in the San Francisco Bay Area; another trip to the Stinking Rose garlic restaurant and a long walk in the city plus a little cable car action. We like walking with them in the hills west of the Bay, and visiting the waterfront and the excellent restaurants. They have been working hard fixing up their house, and it shows! Earlier, Bob and Duncan replaced the electrical service entrance, another of those two-hour jobs that always take longer. Successful, though; it even passed inspection! And, in one of the busiest 24-hours on record, we kicked off this Christmas season with a trip to the Crystal Cathedral in L. A. for their awesome Christmas pageant (super music and a retelling of the Christmas story, complete with live actors and animals on stage) in this most impressive glass building. Then back to Santa Barbara, a full day's work the following day, plus dinner at sidewalk tables at a downtown cantina, with the Christmas Parade passing by, followed by the Canticle a capella Choir's Christmas concert. Then home to begin trimming the tree and to process the SB Newcomers' mailing list for December. All four "kids" will be here for Christmas, and we'll celebrate the Chalmers' first anniversary, on a catamaran in our ocean! We'll be on the world's largest such boat, thanks to its Berkshire-Hathaway owners and the Newcomers organization. And now, just before Christmas gets to its peak, we have to cut-and-print so this can reach you during the season. Each of you have shared part of your lives with us in some way over the years, and at this season we reflect that we are better for it. We try to return the favor in wishing you well and happy for Christmas and the New Year. Holiday greetings from Bob and Ellen Lilley! Happy Holidays once again, from sunny California! We continue to sample the delights of the Santa Barbara area (when we can stay in town; there's been lots of travel). Gwindal the cat now goes to the Humane Society kennel while we're on trips. That's new for him and for us. He's just too unpredictable with neighbor caretakers. Some in Athens will agree with that! The Hollywood Bowl is within striking distance, and we heard the Los Angeles Symphony's Beethoven 7th Symphony down there. Also in the Los Angeles area we got to visit the Crystal Cathedral, and spent some time with former Ohio University students Rich and Sally Salter and their family. The Santa Barbara Civic Light Opera continues to be most entertaining, and we saw Leslie Nielson do a serious(!) piece on the Life of Clarence Darrow. Visited some excellent wineries in the area; discovered new favorites. We found local artist Kathy Dusi, and with her help designed two leaded-glass windows for the living room; an Arthurian dragon and a Japanese one. Beautiful and unique. You may have seen news that Santa Barbara tried to burn down its ocean pier this Fall; actually the news footage made the fire look worse than it was. Still, a restaurant disappeared, and a $6 million repair program is underway which may take two years. Suzanne and Andy Harshman were married May 2 in Toledo. We know, we know -- every wedding is the most beautiful ever, but this one really was enjoyable. A beautiful cathedral setting, wonderful music, much of it by family members, and of course the joy of having the family all together! Later, Suzanne moved us both with the simple words, "It was exactly what I've dreamed of." We have some prized pictures of a very classy couple on their honeymoon cruise. At Thanksgiving, we visited them at their new house; very comfortable except for Bob's bout with the 24-hour flu. He recovered in time to enjoy a late turkey dinner on Saturday and time with the Harshman clan. Karen and her beau Duncan Chalmers moved from Columbus, Ohio, to San Mateo, near San Francisco in June. We visited the redwood trees at Muir Woods north of the Golden Gate with them, and the Marin Headlands, which give a stunning view of the Bridge. In November, Karen and Duncan announced their engagement (Duncan proposed at that very romantic spot). They've gotten us interested in ocean kayaking. It's great exercise, and finally we found an affordable boat for Ellen! Karen transferred from the Limited to the Gap, still doing store design, now as a senior designer. Duncan works for Turner Construction in the city as a Special Projects Manager. We've had guests all year long. It has been fun to see Dale and Jean Johnson and two grandchildren (he was a Loran receiver person who's now building airplanes with Ray Morrow and Burt Rutan), Susan Gilfert (our English-teaching friend from Athens by way of Japan) and a variety of family members. We tried out the house on a 35-person reception for Newcomers, and it worked just fine. Come and visit; we love company! Friend and Shaklee worker Shawna Wolfe from Athens visited in September; we did some kayaking, visiting some of the sea lions that hang out on the buoys in the Santa Barbara channel. Shawna and Ellen visited San Francisco, walking up and down the hills for about nine miles one afternoon. The Rob Stengels (he's on the Princeton faculty) visited, on their way to Palo Alto and Stanford University, where he's spending part of his sabbatical. Good friends from the Ohio days. There was much rain in sunny California this past winter, thanks to the infamous El Nino; wet but generally warmer than usual. This year (La Nina?!) is colder but not as wet, yet. We went to Bob's relatives' place in Kansas city to celebrate his parents' 60th anniversary and also his uncle Roy's 99th birthday. Heavy thunderstorms greeted us; those aren't frequent in the west. Traveled in October to Boston to manage and participate in the annual International Loran Association Convention, then on to Ohio University for Homecoming. Saw good friends Dave Diggle and Hope Mills and the new house, complete with a Fall invasion by ladybugs! Nice weather, Ohio won the football game, we saw many friends and alumni; attended the rock and roll dance (never thought we'd hear the 50's group The Shirelles again). On top of that, managed to visit both Ellen's mom in Cleveland and Bob's folks in Charleston. Drove 650 miles! A beautiful time to visit Massachusetts, Ohio and West Virginia. The Fall colors were in full swing. Now if we just could have connected with Bob's sister in New York and Ellen's sister near Columbus, we'd have done it all on that trip! Bob spent some time with John and Marilyn Beukers in Florida (he said he was working on navigation systems the entire time but also said the weather and the company were just fine!). His work at Illgen Simulation is challenging and rewarding; it's hard work, though, keeping government and industry sponsors in line and keeping the work coming in. Not unlike the Avionics job at Ohio. Bob was named an Illgen Vice-President in September, concentrating on navigation and communications systems. He organized tests of Loran-C antennas in Athens in November, which were very successful. It was good to work again with Avionics Center friends. Sadly, we lost Bill Polhemus and Jim Culbertson during the year. Both were Bob's colleagues and our close friends from Loran-C technical work and the Loran Association. We've had many visits and travels with Jim and Joann since our move to the west coast. Bob and Jim were invited to San Francisco last April to appear at the National Boating Federation meeting there, and they were working to sell the Coast Guard on some technical projects. It's been a busy year, obviously, with many new experiences. The trips back to the East kept us in touch with family and long-time friends, the family overall is healthy and happy. Wishing you that same health and happiness for the Holiday season and the coming year! Here’s another one of those Christmas letters! Actually, it all started in the Fall of 1996, with Bob’s selection as the Spring Quarter, 1997, Kohei Miura visiting professor at Chubu University in Kasugai, just north of Nagoya, Japan. Once we accepted that three-month opportunity, we got back to the business of running the International Loran Association’s 25th annual Convention and Technical Symposium in San Diego (Ellen is the Association’s Executive Director, and Bob was Convention Chairman that year). This November, 1996, event was most successful! Right in the middle of the event, our friend John Illgen, CEO of Illgen Simulation Technologies in Santa Barbara, CA, asked if Bob would come to California to join his company. After more than 37 years in Athens, Ohio, Bob’s 35-year career at Ohio University, and with some concern for the portability of Ellen’s Shaklee business, we decided to make the move. We decided this just about the time we left for Japan, so many of the final arrangements had to be done by electronic mail. The trip was made possible by Shawna Wolfe agreeing to run Ellen’s business and hold house and cat together for three months; we’ll always be grateful. The Japan trip was exhilarating! So much to learn and experience, and fortunately we had three months in the country. We did the usual sightseeing, experienced Tokyo and Hiroshima, Mount Fuji and the temples and shrines, and the Shinkansen bullet-trains, found what seemed like hundreds of excellent restaurants, large and small, and learned to eat things that do not seem to fit easily into any of our familiar food groups. For those who have not tried it, sashimi (yep, that’s raw fish) is good and sushi can be excellent! The Chubu Lectures were well-received , as was an address to the faculty on the occasion of the school’s Founder’s Day, which Bob delivered in Japanese! (phonetically, of course). It seemed to be well-received; Bob’s still not sure what he said! Thank goodness for a teacher in Japan, Susan Gilfert, of the Athens Gilferts, who was a patient tutor. Karen got to spend a few days with us there. Japan was a wonderful time with wonderful people we will not forget; we both are different people for the experience, and we would return without hesitation. Bob retired at Ohio, and we set mid-October for the move. First, we traveled to Ottawa, Canada, for the 1997 ILA convention, with Ellen running the administrative details and Bob delivering a paper and handling preparations for the proceedings book. We returned to Athens three days before the movers arrived to pack us up! The Engineering College and Electrical Engineering Department at Ohio University gave receptions and the Avionics Center had a dinner. We felt good that many people came and said nice things, but it was also a time for us to thank the people who gave us a chance to succeed at engineering and also the ballroom dance club and the Child Review Board and many other activities. Athens was very, very good to us. The move was really something. Ellen, Bob and our hyperactive cat Gwindal in the Toyota pickup. First to Chicago to pull for Team Suzanne, who finished her first competitive race (the Chicago Marathon no less!) running with her fiancé’ (that’s right, May 1998) Andy. Karen came to Chicago also, and the Lilleys and Andy’s family the Harshmans had some time together. Then on to Cedar Rapids, Iowa, and a visit with Daryl McCall and family (he’s a former OU student of Bob’s) and on to Kansas City and Bob’s uncle Roy and aunt Laura. Always a good time, but the weather forecast was deteriorating. We set out for Scott City Kansas to see former Athens friends Ron and Sue Boyson, arriving the day before the thunderstorms, rain and blizzard closed down everything in every direction for two days. Had a chance to catch up on old times and do some snow shoveling (our last??) before heading south and west to avoid Denver, still closed. There were cattle out of their pastures and on the road due to the snowdrifts, being herded by cowboys on horses and in Jeeps...quite a sight. Santa Barbara is a spot we’ve visited many times with those sort of wistful thoughts... "...just maybe we could wind up here someday..." As California towns go, it has kind of a small-town feel that is comforting to us, and although we miss our friends and our deer and our lake in Athens, we are enjoying the fact that we indeed live here now. We’ve been taking in the local theater (even high-school theater!) and the excellent restaurants, and trying to get rid of all those cardboard boxes from the move! Now, here we are at Holiday time, far from many of the people who have always made Holidays special for us, and while we don’t regret the decision to move, we do miss you. We’ll have Karen from Columbus and Suzanne and Andy out from Toledo for a few days in December and January, and Ellen’s mother will be here during Christmas itself, so we’ll have family around. We’re talking to Bob’s mother and dad and sister Ruth about a visit too. One of the first rooms we "finished" is the guest room. Come and visit the land of the red tile roof and the blue sky -- we’ll go to the beach and taste the local wines and have some good food and generally visit. Remember, being in the snow out here is optional and voluntary -- on the mountaintops. ...and until we meet again, may God hold you in the palm of his hand. Merry Christmas!